It’s hot outside and most days you end up at the beach, playing in the sand, building sand castles and goofing off in the water. For those adventurous types, a day at the beach is much more than you think and a little sand and water is not enough for a relaxing good time. These people need adventure in the water in the form of water sports. Paddle boarding and Kayaking. Those people you see out in the ocean standing on a board just going about their business and getting a good workout. Looks easy right? Wrong. Good luck standing on that board the first couple of tries. It makes it so much fun to get out, put your brave face on and stand. You will fall, a lot, if this is your first time, but you will get the hang of it eventually and it is the best thing. If your balance is not great, kayaks are a great way to explore and not have as much difficulty and no standing required. Both of these relaxing adventures are a great workout and you will feel so accomplished when you tell your friends. Parasailing. If you’ve ever been to a public beach, chances are you have seen those parachutes carrying people behind a boat. You think “Oh, that looks fun,” and decide to try it. Yes, try it and try it with friends. It is so much more fun to do a double or triple parasail and experience it with friends. You will get a bird’s eye view of everything and it is very peaceful when you are in the air. The best part is if there are multiple groups going at the same time. You not only get to parasail, but you get a speed boat ride too and that’s always fun. Jet Skiing. Jet Skiing on the Gulf is harder than you think, but more fun than you could imagine. If you have ever been jet skiing on a lake or in the river you have an idea, but the Gulf is a different story. Just getting out past the waves is the best part. Make waves and jump waves, be free and see the beach from a different point of view and rev up your adrenaline in the process. 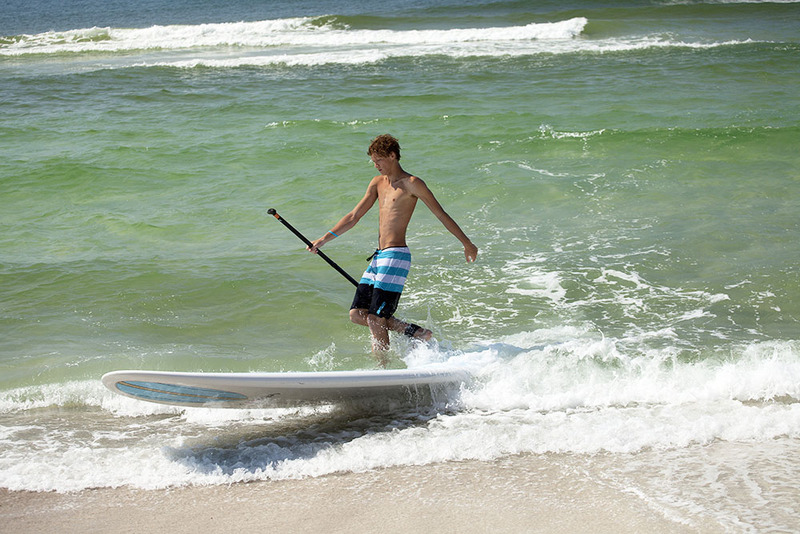 There are so many options and ways to have an adventure on the beach and on the Gulf. Whether you want a relaxing workout, an adrenaline rush or something in between, water sports is the way to go and no matter what the only thing that matters is #creatinghappymemories.